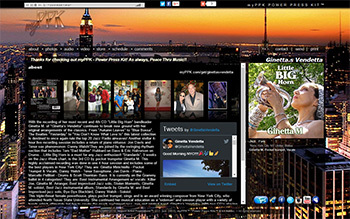 Electronic Press Kit Service and global website of choice for start-ups, stars and legends on six continents including GRAMMY® Winners & Nominees, Multi-Platinum-selling artists, Rock-N-Roll Hall of Famers, American Idol® | The Voice® | X-Factor® contestants, Guitar Legends, Worship Leaders, Actors, Top Models, Tribute Artists, Magicians & more! Not Only For Performers! Motivational Speakers, Authors, TV Personalities, Management & Talent Agencies, Chefs, Film Makers, Colleges, Record Labels, Producers, World-Champion and Olympic Athletes & Trainers, International Businesses... Those promoting themselves, others, a company, a product, or a service! Electronic Press Kit Service to Start-ups, Stars & Legends! "Love you guys! I've gotten so much work from you! This is definitely the best advertisement and marketing I have ever had. EVER! Thank you!" Do you have to be a star to use this service? OF COURSE NOT! If you are a star or representative thereof, do we have everything you need to promote your skills, artists, talents, or message globally and professionally with incredible impact? Set up a new Power Press Kit all by yourself in just minutes with no assistance needed from us! It's that easy! Each kit intelligently adapts to each individual user and includes a completely mobile-friendly version as well. Your new professional image and global promotional power are only moments away. Allow us to get this out of the way early: We do not directly connect you with venues or events, send you leads, tune your guitar, do your laundry or groom your cat. After decades of experience in the industry, we know that your press kit becomes effective when you do! If you've got the goods, our service will deliver them in a professional, structured, impactful and enticing manner and the rest is left to fate and your perseverance in following up (which our advanced tracking tools help you do quickly and easily). Additionally, we will not send you six unsolicited emails every week telling you why we're so cool. If we did our job right, you'll figure that out on your own. Also, if a particular module that we provide doesn't apply to you, don't use it and it won't appear on your PPK. No blank pages or empty content here, just your professional image waiting to be discovered. 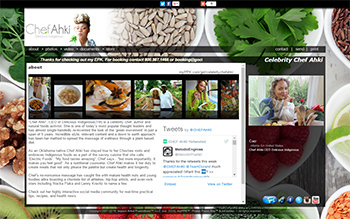 myPPK is a revolutionary electronic press kit that is a power-packed arsenal of promotion. The one absolutely essential, unique and evolving marketing tool for every person or group looking to promote themselves, others, companies, products or services locally or internationally! And it's cool and versatile enough to be used as your primary website at the same time! Additionally, we have special enhancements tailored specifically to Labels, Producers and Artist / Model / Actor Management agencies as well as Colleges and Universities that allow you to showcase - not only your own company - but every artist you work with who also has a PPK, all in one clean, tight, comprehensive, attractive and powerful PPK package!! We've worked with industry talent buyers, labels, producers, radio, TV, clubs, newspapers, magazines and the like for years and we constantly stay in tune with what they demand. The PPKs are built around what they demand, what you need and want, and what we've developed to be super powerful yet super easy to use and super inexpensive to you. Our support team is on our keyboards seven days a week, up to 20 hours a day to quickly answer your every question and take your requests. myPPK technologies are built on the very latest Microsoft .NET framework which is packed with power, stability, security and functionality. The myPPK development team (having logged decades of experience in corporate and music marketing and web development) spent months developing, analyzing, experimenting and perfecting the functionality making it as easy-to-use as possible while maximizing the raw power. Then our design team took over and gave them some attitude. For the cost to produce and mail one physical press kit (or purchase 1 beverage at your local club) - you can send myPPK an unlimited number of times and endlessly increase your chances of success. There are never additional usage fees or expenses. And the best part, when you have updates to make, you don't have to print more kits and throw the old ones out! Just login to your admin panel and update your kit live-time. So give it go!! It doesn't cost you a dime to take your FREE TEST FLIGHT of the new electronic online press kit revolution... myPPK™ - Power Press Kits™. Just make sure that you're securely strapped in. Significant G's may ensue. 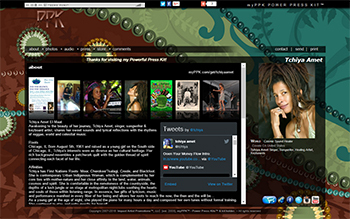 Power Press Kits is the legitimate love child of Impact Artist Promotions, LLC (IAP) which began providing comprehensive website development, photography, entertainment marketing and artist development services in 2003 for individuals, groups, Grammy-nominated producers, promoters, big-city studios and night clubs, and record labels including NYC's Wind-Up Records. Artists with whom IAP has worked have experienced International radio play, toured the world, placed music on major-movie soundtracks, graced the covers of international music magazines, jumped out of airplanes, taken long walks on the beach, and signed deals with major labels. Today all IAP cares about, focuses on, and obsesses over is you, your Power Press Kit, and how it promotes your madd skills to the world! Featured PPK of the Week! 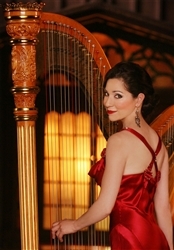 ANNA MARIA MENDIETA, principal harpist with the Sacramento Philharmonic & Opera, performs concerts of all styles from classical to contemporary, as a soloist, with orchestras, and with her touring ensembles including TANGO DEL CIELO (Tango of Heaven). She has toured all over the US as well as parts of Europe, South America, and China, and has performed for Pope Benedict XVI, President Clinton, President Gorbachev, and the King & Queen of Spain. Her unique specialties include the tango music of Astor Piazzolla and the classical concertos of Joaquin Rodrigo. Some programs feature a tribute to the Silver Screen. When she's not pulling strings, she is out on the dance-floor as a part of the show!